Do I not work? Don't I work? Do you not work? Don't you work? Does he not work? Doesn't he work? Does she not work? Doesn't she work? Does it not work? Doesn't it work? Do we not work? Don't we work? Do they not work? Don't they work? 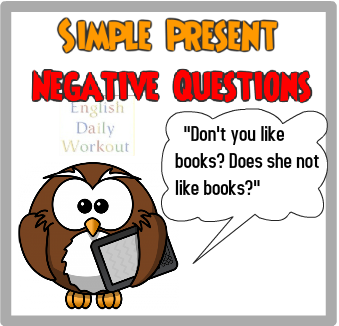 Change the affirmative statements into negative questions. Give both the forms without contractions, and the forms with contractions. She walks to work. Does she not walk to work? Doesn't she walk to work? They take the bus. Do they not take the bus? Don't they take the bus? 1. Do I not hurry home? Don't I hurry home? 2. Does he not drive a truck? Doesn't he drive a truck? 3. Do you not follow the news? Don't you follows the news? 4. Do they not want a pet? Don't they want a pet? 5. Does she not like flowers? Doesn't she like flowers? 6. Do we not need tea? Don't we need tea? 7. Does she not answer the questions? Doesn't she answer the questions? 8. Does he not drink coffee? Doesn't he drink coffee? 9. Do I not learn quickly? Don't I learn quickly? 10. Does it not rain heavily? Doesn't it rain heavily?